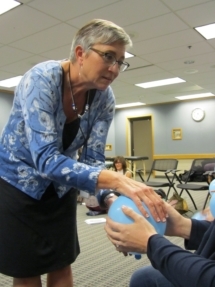 This is two-days of hands-on immersion to learn a variety of manual techniques to create space for better baby positioning for professional bodyworkers who are already skilled in soft-tissue work and actively working with pregnant people. Detailed discussion of anatomy and contraindications for use of each specific technique will be included during this workshop. Students will learn a series of highly effective techniques for creating more space in the pregnant body to allow the baby to settle into a vertex position. Note that throughout both days instructors will be doing one-on-one assessment to be sure students are safely implementing these techniques. Class size will be very limited to insure plenty of one-to-one supervision of hands-on work. Students will be practicing all techniques on each other as well as pregnant models. All registered students will be required to complete reading and a quiz prior to attending this workshop. This material will review spinal pathologies and prenatal complications that may present contraindications for use of certain techniques that will be learned. During the workshop you will be tested by the instructors in a role-play setting as well. Day 1: The first day we will go through the basics of creating space, techniques you can show your families to take home, how to find resources in your area of breech supportive providers, and assessments to determine what may be helpful beyond what you are able to provide. The basic manual techniques are safe for a majority of people to do and receive, and can be done quickly (after a bit of practice). We will go over basic ligament release, superficial fascial opening, relaxing the lower back, and posterior pelvis. The second day we will delve into more advanced manual techniques to create mobility and stability in the joints. In this part of the course we will go into detail on releasing deeper tissues in the abdominopelvic cavity, the importance of working extremities when compensation patterns are present, and techniques to release the diaphragm, lumbar, sacrum and psoas. Participants for Day 2 MUST attend both days. The first four hours may be review for those who have taken Integral Touch of Birth, but I promise you will take away new and deeper understanding each time you encounter this material. If you have experience in other training that you believe may qualify please submit a letter with details. Who Should Attend: Day 1 may be taken as a stand-alone workshop for birth workers (doula, midwife, labor and delivery nurse) who do not qualify for the full workshop. To attend the full two-day workshop you must be a professional bodyworker. Note: if you have not previous experience with this technique a one-day course will be offered the day before Breech Balancing. Please be sure to register for “Craniofascial Technique: Introduction to Unwinding for Bodyworkers” or complete one of the other accepted course prior to the first day of Breech Balancing.